Burned-out Magirus-Deutz furniture mover van near Chełmno extermination camp, type used by the Nazis for suffocation, with the exhaust fumes diverted into the sealed rear compartment where the victims were locked in. This particular van had not been modified, as explained by Office of the United States Chief Counsel for Prosecution of Axis Criminality (1946), nevertheless, it gives a good idea about the process. Mass graves in the Soviet Union were used for the burial of mass numbers of citizens and foreigners executed by the government of the Soviet Union under Joseph Stalin. These mass killings were carried out by the security organisations, such as the NKVD, and reached their peak in the Great Purge of 1937–38. Heinrich Luitpold Himmler was Reichsführer of the Schutzstaffel, and a leading member of the Nazi Party (NSDAP) of Germany. 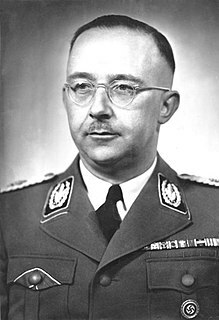 Himmler was one of the most powerful men in Nazi Germany and among those most directly responsible for the Holocaust. Arthur Nebe (help·info) was a key functionary in the security and police apparatus of Nazi Germany and a Holocaust perpetrator. Mogilev is a city in eastern Belarus, about 76 kilometres from the border with Russia's Smolensk Oblast and 105 km from the border with Russia's Bryansk Oblast. As of 2011, its population was 360,918, up from an estimated 106,000 in 1956. It is the administrative centre of Mogilev Region and the third largest city in Belarus. Chełmno extermination camp, built during World War II, was the first of the Nazi German extermination camps and was situated 50 kilometres north of the metropolitan city of Łódź, near the village of Chełmno nad Nerem. Following the invasion of Poland in 1939 Germany annexed the area into the new territory of Reichsgau Wartheland, aiming at its complete "Germanization"; the camp was set up specifically to carry out ethnic cleansing through mass killings. It operated from December 8, 1941 parallel to Operation Reinhard during the most deadly phase of the Holocaust, and again from June 23, 1944 to January 18, 1945 during the Soviet counter-offensive. Polish Jews of the Łódź Ghetto and the local inhabitants of Reichsgau Wartheland (Warthegau) were exterminated there. In 1943 modifications were made to the camp's killing methods because the reception building was already dismantled. Einsatzgruppen were Schutzstaffel (SS) paramilitary death squads of Nazi Germany that were responsible for mass killings, primarily by shooting, during World War II (1939–45) in German-occupied Europe. The Einsatzgruppen were involved in the murder of much of the intelligentsia, including members of the priesthood, and cultural elite of Poland, and had an integral role in the implementation of the so-called "Final Solution to the Jewish Question" in territories conquered by Nazi Germany. Almost all of the people they killed were civilians, beginning with the intelligentsia and swiftly progressing to Soviet political commissars, Jews, and Romani people as well as actual or alleged partisans throughout Eastern Europe. It was slow — some victims took twenty minutes to die. It was not quiet — the drivers could hear the victims' screams, which they found distracting and disturbing. The gas vans are extensively discussed in some of the interviews in Claude Lanzmann's film Shoah . Claude Lanzmann was a French filmmaker known for the Holocaust documentary film Shoah (1985). The Final Solution or the Final Solution to the Jewish Question was a Nazi plan for the genocide of Jews during World War II. The "Final Solution of the Jewish Question" was the official code name for the murder of all Jews within reach, which was not restricted to the European continent. This policy of deliberate and systematic genocide starting across German-occupied Europe was formulated in procedural and geopolitical terms by Nazi leadership in January 1942 at the Wannsee Conference held near Berlin, and culminated in the Holocaust, which saw the killing of 90% of Polish Jews, and two thirds of the Jewish population of Europe. Nazi Germany built extermination camps during the Holocaust in World War II, to systematically kill millions of Jews, Slavs, Poles, Roma, Soviet POWs, political opponents and others whom the Nazis considered "Untermenschen" ("subhumans"). The victims of death camps were primarily killed by gassing, either in permanent installations constructed for this specific purpose, or by means of gas vans. Some Nazi camps, such as Auschwitz and Majdanek, served a dual purpose before the end of the war in 1945: extermination by poison gas, but also through extreme work under starvation conditions. Bełżec was a Nazi German extermination camp built by the SS for the purpose of implementing the secretive Operation Reinhard, the plan to eradicate Polish Jewry, a key part of the "Final Solution" which entailed the murder of some 6 million Jews in the Holocaust. The camp operated from 17 March 1942 to the end of June 1943. It was situated about 0.5 km (0.31 mi) south of the local railroad station of Bełżec, in the new Distrikt Lublin of the semi-colonial General Government territory of German-occupied Poland. The burning of exhumed corpses on five open-air grids and bone crushing continued until March 1943. Operation Reinhard or Operation Reinhardt was the codename of the secretive World War II German plan to exterminate Poland's Jews in the General Government district of German-occupied Poland. This deadliest phase of the Holocaust was marked by the introduction of extermination camps. Sobibor was a Nazi German extermination camp built and operated by the SS during World War II near the railway station of Sobibór near Włodawa within the semi-colonial territory of General Government of the occupied Second Polish Republic. Operation Tannenberg was a codename for one of the extermination actions by Nazi Germany that was directed at the Poles during the opening stages of World War II in Europe, part of the Generalplan Ost for the German colonization of the East. The shootings were conducted with the use of a proscription list, compiled by the Gestapo in the span of two years before the 1939 invasion. Herbert Lange was an SS-Sturmbannführer and the commandant of Chełmno death camp until April 1942; leader of the SS Special Detachment Lange conducting the murder of Jews from the Łódź Ghetto. He was responsible for numerous crimes against humanity including the murder of mental patients in Poland and in Germany during the Aktion T4 "euthanasia" programme. Otto Ohlendorf was a German SS functionary and Holocaust perpetrator during the Nazi era. An economist by education, he was head of the Sicherheitsdienst (SD) Inland, responsible for intelligence and security within Germany. In 1941, Ohlendorf was appointed the commander of Einsatzgruppe D, which perpetrated mass murder in Moldova, south Ukraine, the Crimea, and, during 1942, the North Caucasus. He was tried at the Einsatzgruppen Trial, convicted, and executed in 1951. The Holocaust, also known as the Shoah, was a genocide during World War II in which Nazi Germany, aided by local collaborators, systematically murdered some six million European Jews—around two-thirds of the Jewish population of Europe—between 1941 and 1945. Jews were targeted for extermination as part of a larger event during the Holocaust era, in which Germany and its collaborators persecuted and murdered other groups, including Slavs, the Roma, the "incurably sick", political and religious dissenters such as communists and Jehovah's Witnesses, and gay men. Taking into account all the victims of Nazi persecution, the death toll rises to over 17 million. The Lviv pogroms were the consecutive massacres of Jews living in the city of Lwów, perpetrated by the German commandos, local crowds and the Ukrainian nationalists from 30 June to 2 July 1941, and from 25 to 29 July 1941, during the Wehrmacht's attack on the Soviet positions in occupied eastern Poland in World War II. Historian Peter Longerich and the Holocaust Encyclopedia estimate that the first pogrom cost at least 4,000 lives. It was followed by the additional 2,500 to 3,000 arrests and executions in subsequent Einsatzgruppe killings, and culminated in the so-called "Petlura Days" massacre of more than 2,000 Jews, all killed in a one-month span. Janowska concentration camp was a Nazi German labor, transit and extermination camp established in September 1941 in occupied Poland on the outskirts of Lwów. The camp was labeled Janowska after the nearby street ulica Janowska in Lwów, renamed Shevchenka after the city was ceded to the Ukrainian SSR at the end of war in Europe. The camp was liquidated by the Germans in November 1943 ahead of the Red Army's counteroffensive. According to Soviet prosecutor at the Nuremberg Trials, Janowska was a pure death camp, although it also housed a factory. Modern estimates put the total number of prisoners who passed through Janowska at over 100,000. The number of victims murdered at the camp is estimated at 35,000–40,000. The Holocaust in Russia refers to the Nazi crimes during the occupation of Russia by Nazi Germany. August Becker was a mid-ranking functionary in the SS of Nazi Germany and chemist in the Reich Main Security Office (RSHA). He helped design the vans with a gas chamber built into the back compartment used in early Nazi mass murder of disabled people, political dissidents, Jews, and other "racial enemies," including Action T4 as well as the Einsatzgruppen in the Nazi-occupied portions of the Soviet Union. Generally his role was to provide important technical support, but on at least one occasion he personally gassed about 20 people. Sonderbehandlung is any sort of preferential treatment, but is known primarily as a euphemism for mass murder used by Nazi functionaries and the SS, who commonly used the abbreviation S.B. in documentation. It first came to prominence during Action T4, where SS doctors killed mentally ill and disabled patients between 1939 and 1941, and was one of a number of nonspecific words the Nazis used to document mass murder and genocide. Another notable example was Sonderbehandlung 14f13. SS-HauptsturmführerHans Bothmann or Hans Johann Bothmann was the last commandant of the Chełmno extermination camp from 1942 on ; leader of the SS Special Detachment Bothmann conducting the extermination of Jews from the Łódź Ghetto and other places. He committed suicide in British custody in April 1946 while in Heide. The Tarnopol Ghetto was a Jewish World War II ghetto established in 1941 by the Schutzstaffel (SS) in the prewar Polish city of Tarnopol occupied by Germany at the onset of Operation Barbarossa. Before the joint Nazi-Soviet invasion of Poland in 1939 Tarnopol was the capital of the Tarnopol Voivodeship in the south-eastern part of the Kresy macroregion in the Second Polish Republic. 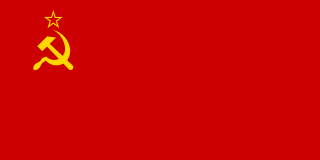 The invading Soviets annexed the city in 1939 to the Ukrainian SSR along with the entire province and renamed it as Терно́поль (Ternopol). 1 2 3 4 Komsomolskaya pravda , October 28, 1990; this source has been cited by several other authors: (i) Catherine Merridale. Night of Stone: Death and Memory in Twentieth-Century Russia. Penguin Books, 2002 ISBN 0-14-200063-9 p. 200; (ii) Timothy J. Colton. Moscow: Governing the Socialist Metropolis. Belknap Press, 1998. ISBN 0-674-58749-9 p. 286, (iii) Солженицын А.И. Two Hundred Years Together (Двести лет вместе), volume=2, Москва, Русский путь, 2002, ISBN 5-85887-151-8, p. 297, (iv) Yevgenia Albats, KGB: The State Within a State. 1995, page 101., (v) Е. Жирнов. «По пути следования к месту исполнения приговоров отравлялись газом». Коммерсантъ Власть, № 44, 2007. , (vi) Н. Петров. «Человек в кожаном фартуке». Новая газета, спецвыпуск «Правда ГУЛАГа» от 02.08.2010 № 10 (31). Archived 2010-08-06 at the Wayback Machine . ↑ Bartrop, Paul R. (2017). "Gas Vans". In Paul R. Bartrop; Michael Dickerman (eds.). The Holocaust: An Encyclopedia and Document Collection. 1. Santa Barbara: ABC-CLIO. p. 234–235. ISBN 978-1-4408-4084-5. ↑ Longerich, Peter (2012). Heinrich Himmler: A Life, p. 547, ISBN 978-0-19-959232-6. ↑ Lewy, Guenter (2000). The Nazi Persecution of the Gypsies, pp. 204–208, ISBN 0-19-512556-8. ↑ Patrick Montague (2012). "The Gas Vans (Appendix I)". Chełmno and the Holocaust: The History of Hitler's First Death Camp. Univ of North Carolina Press. p. Appendix I: The Gas Van. ISBN 0807835277 . Retrieved 2018-09-15. ↑ "Gaswagen, from deathcamps.org, in German". 2006. Retrieved 2018-10-06. Wikimedia Commons has media related to Gas van .